Since 1990 Rifle Basix has manufactured and specialized in aftermarket / replacement triggers for the Remington Model 700 Rifle. 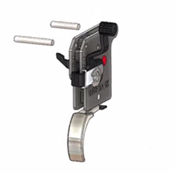 It’s one of our most popular rifle triggers sold to date. Our Model 700 replacement trigger has quite a few benefits listed below. Choose a Trigger or Browse our inventory. We do carry aftermarket triggers that replace the Remington Model 700 X-Mark Pro trigger. You need to purchase one of our Kits. If you have a hard time finding the proper Remington Model 700 replacement trigger you can reach out to us. We’d be more than happy to help.